This Saturday finally saw some good weather in Toronto (it didn’t last long). The sun was shinning and Corey and I decided that we needed to get out of the house. So we braved the traffic and the price of parking and we took a drive downtown, it only takes about 20 minutes. I always forget how close we live to the city. We decided to go to St. Lawrence Market, somewhere I haven’t been in years, and Corey’s never been. Having grown up far from Toronto, Corey still hasn’t seen much of it and I love exploring it with him and taking him to all of my favourite spots. St. Lawrence Market is a treasure trove of Toronto. It’s always packed full of the hustle and bustle of the city, vendors yelling out for meats and cheeses, tourists stopping in the most inconvenient spots to take pictures, etc. But I love every minute of it. It’s such a cool place. Some of the best meats, cheeses, fish, breads, fresh fruits and veggies, homemade jewellery, soaps, freshly roasted coffee, etc. can all be found here under one roof. And the experience of it all is just wonderful. I swear Corey and I both had goofy grins on our faces all day, especially after eating massive peameal bacon sandwiches and butter tarts. We took home some double smoked bacon, peameal bacon, and two loaves of freshly baked bread, white and sourdough. And boy did we ever have the best breakfast Sunday morning!! And there was so much more left over. Moments ago I made a delicious sandwich with more bread and peameal!! It’s so much cheaper to buy at the market than the grocery store. I really wish that shopping at local markets was still the main source of groceries. St. Lawrence Market is one of those Toronto highlights that I always overlook, but after this visit I do believe I’ll be heading back again soon! 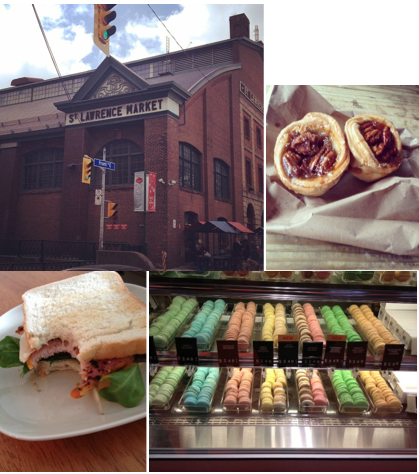 Have you ever been to the St. Lawrence Market? Do you know of any other great markets around the city? http://littleladybirdbeauty.blogspot.ca/ I nominated you for a Liebster Award! My favourite picture in honour of #NotreDame found on Facebook. @coreykember and I just booked our honeymoon to Paris and I was so excited to show him my love of the architecture. Sadly one less building to introduce him to.